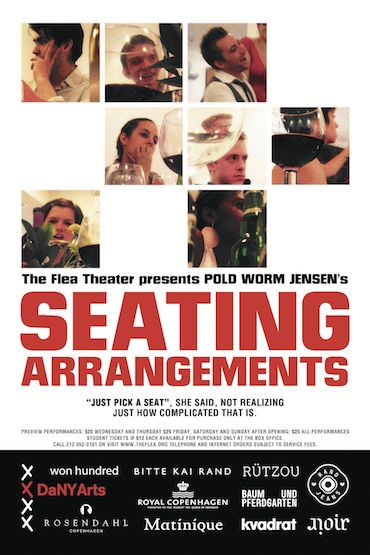 The Flea is pleased to present seating ARRANGEMENTS, a theatrical invention formed through a unique collaboration between The Bats, The Flea’s resident acting company, and Pold Worm Jensen, three experimental theater artists from Copenhagen, Denmark. Seating ARRANGEMENTS takes place around a table which in turn becomes an elaborate banquet, a forum for political debate, and a platform for personal discovery. Playing themselves, the Bats share their own stories: they rap about their difficulties with religion, they toast to gay rights, they make a stand on the war on drugs and the lack of public health insurance, all accompanied by an electric violin. More than a play, seating ARRANGEMENTS is a theatrical experiment about the wondrous and horrendous exchanges that take place around a table. Dramaturge Allan Richard Jensen has worked as dramaturge professionally since 2000 at major theaters in Copenhagen. Allan is also a playwright and has collaborated across the Atlantic, with among others director Marc Fratello (New York). seating ARRANGEMENTS is presented as part of DaNY Arts, which is a cooperative cultural initiative between artists and arts institutions in Denmark and in New York. The aim of the project is to establish new connections, explore the process of artistic collaboration, and mutually benefit from each other’s background and experience. DaNY Arts will take place from 2006 through 2008. Although new works of art will certainly result, the focus of DaNY Arts will be on the collaborative process itself. The project is supported by The Danish Arts Council and The Danish Arts Agency. The Danish Arts Council and the Danish Consulate General in New York administer DaNY Arts with the New York Foundation for the Arts as advisory partner.